Siyi Pavilion sits on the top of the Yingkui Hill and houses a big bronze bell, engraved with the names of local academic luminaries. Sometimes it’s hard to understand the mindset of ancient Chinese scholars who built gorgeous gardens but guarded them from public view behind closed doors. The founder of Huilong Pond Garden in northern Shanghai’s Jiading District was not so selfish and narrow-minded. He wanted a garden that would enchant and entice the public. Looking north as you drive along Shaxia Road, you see some of the garden’s features reveal themselves — Yingkui Hill, the pond and the pavilion in the middle of the lake. The rest of the garden is tucked away behind lush greenery, inviting you to come inside. The bank of the pond is studded with century-old trees, some trunks almost entirely hollow. Yingkui Hill was built in 1460 as a partition of sorts, separating the nearby Confucian Temple to the north and Liuguang Temple to the south. Today, only the Confucian Temple remains, converted into a museum to house an exhibit dedicated to China’s ancient imperial examination system. The site is open free to the public. The hill, built up with rocks and earth, is not easy to climb but the view at the top is worth the effort. The path leading to the top is narrow, twisty and steep. On the way up a small stone cave adds an interesting feature to the hummock. Siyi Pavilion sits on the top of the hill. The two-story brick-and-wood pavilion houses a big bronze bell, engraved with the names of local zhuangyuan, or those who got the highest scores in the national exam. At the foot of the hill, a zigzagging stone bridge leads to the mid-lake Jiale Pavilion, where you can sit and enjoy a refreshing breeze to cool down after climbing the hill. Kui Star Hall used to be part of the Confucian Temple. Opposite the hill is a white-washed hall with gray roof tiles. Kui Star Hall on the eastern bank of the pond was once a part of the Confucian Temple. It was built during the latter half of the 17th century, destroyed by the Japanese invaders in 1937 and then rebuilt in 1979 to its original style. The only old remnant is a stone slab carved in 1827 with the hall’s history. Kui Star, an ancient Chinese constellation, was worshipped as the god of scholarship. The hall was once a shrine where literati prayed for a smooth academic career. 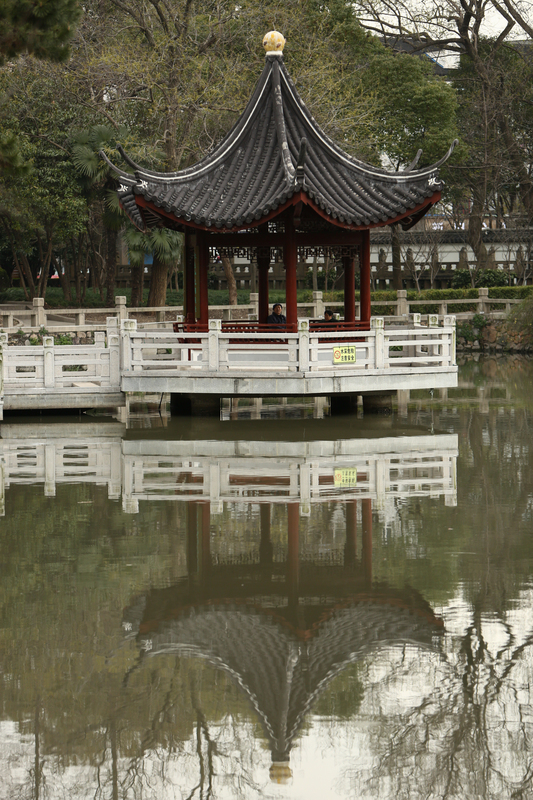 Unlike a typical Suzhou garden where a web of pathways precludes the necessity for walkers to double back on themselves, Huilong Pond features many dead-ends. They probably reflect the number of times the garden has been redesigned, expanded and rebuilt over the centuries. 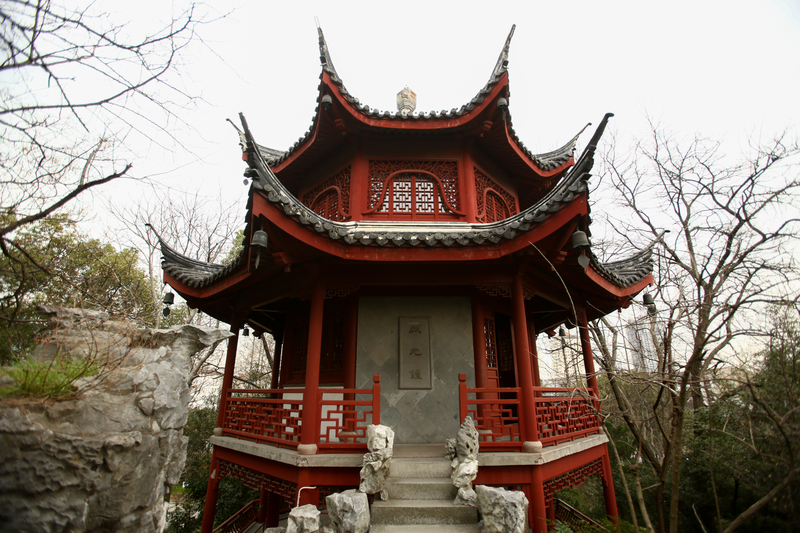 The garden was originally built to adorn the Confucian Temple. In 1928, the local government renovated the pond, temple, hill and Kui Star Hall. In 1937, much of the garden was destroyed during the Japanese invasion. It lay deserted for almost 30 years before authorities initiated a three-year renovation project in 1976. In 1980, a second three-year restoration project was undertaken. Many old architectural structures from other areas in Shanghai were relocated to the garden. A few steps away from the Kui Star Hall on the eastern lawn is an ancient opera stage built in 1889 and moved to the site from Zhabei District (now Jing’an District) in 1976. The 135-square-meter stage is architecturally interesting. It is decorated with woodcarvings of phoenixes, suns and 12 scenes in relief of ancient mythologies, all framed in gold. The stage’s golden domed roof is painted with 440 birds and is said to provide perfect acoustics. Gourd-shaped Bihe Lake covers about 1,000 square meters in the garden. It is decorated with rockeries and a small waterfall. The lakeside pavilion, built in the early 1500s, was relocated to the garden in 1977. A stone well in the pavilion used to offer fresh water for passers-by, but today it’s dry. Yi’an Hall is the main building in the garden’s north. It was built in 1885 and moved from the district’s Hai’erqiao area to Huilong Pond in 1981. A 3-meter-tall rock from Taihu Lake stands in front of the courtyard. Pockmarked with pores and holes from decades of water weathering, it has become a standard for judging a Taihu rock. Xizhao Kiosk is located west of the Yi’an Hall, linking to the northern lawn. On a rainy day, it’s a peaceful refuge, and it is also popular for viewing sunsets. On the other side of the northern lawn, there is a stone pagoda, 4 meters high, carved with Buddha statues on three sides and a sutra on the fourth. 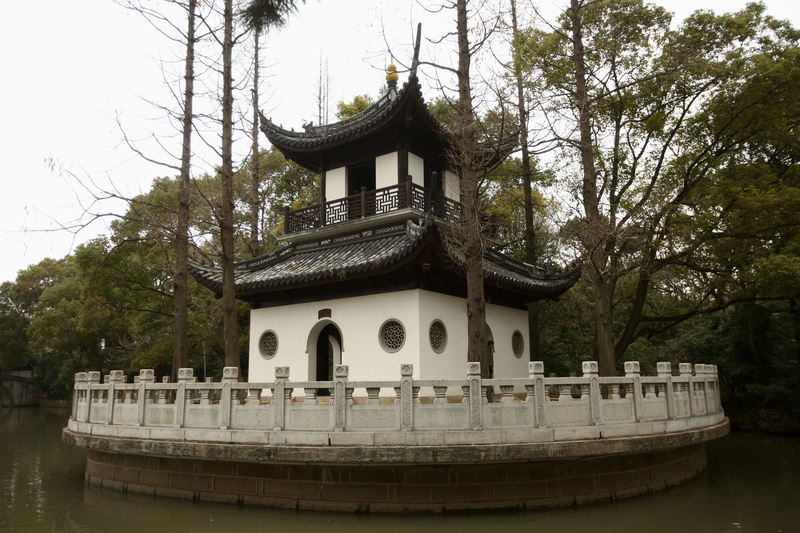 The pagoda was discovered near the southern gate of the old Jiading city wall and relocated to the garden in 1980. Not far away are Suiyu (Broken Jade) Hall and Suiyu Spring, both featuring rockeries and maple trees. The spring water rippling out of a small cave sounds like tinkling pieces of jade. 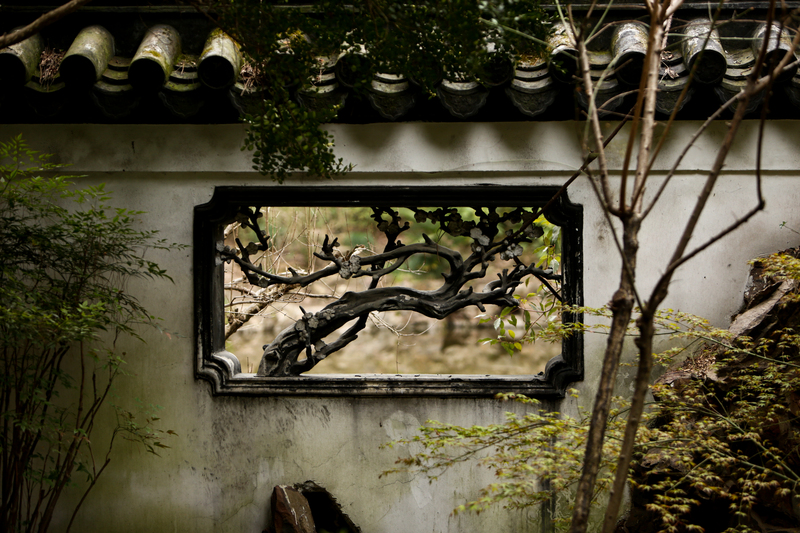 Windows carved with tree patterns adorn many corners of the Huilong Pond Garden. How to get there: Take Metro Line 11, get off at North Jiading Station, and then take Jiading Bus No. 13, 9 or 68 to the garden.